Although Justin has spent all of his adult life in the Midwest, he actually grew up in New York. Living in the Northeast Justin had a chance to experience it all: thunderstorms, big winter nor’easters and the occasional threat of a tropical storm. Unlike some meteorologists, Justin wasn’t a weather nerd his whole life. Sports, acting and singing took up most of his childhood and it wasn’t until high school that he decided to pursue his passion of weather. After moving to the Midwest, Justin received his BS in Meteorology from Valparaiso University in northern Indiana. While at Valpo Justin took an interest in storm chasing and logged over 18,000 miles chasing all throughout the Plains states. 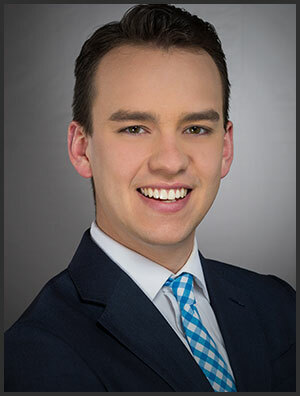 After graduation, Justin moved to Minnesota where he worked for KAAL-TV in Rochester, MN forecasting for southeastern Minnesota and northern Iowa. In 2017 Justin received his CBM (Certified Broadcast Meteorologist) from the American Meteorological Society. Following Minnesota, Justin married his storm chasing partner Stephanie and checked another Midwest state of his list moving to Wisconsin. He started at CBS 58 as a freelance meteorologist in 2015 and was promoted to weekend meteorologist a few months later. In 2016 Justin got to road trip to Super Bowl 50 as a digital producer and meteorologist for CBS 58 which is a career highlight that will last for years. Since his arrival in Brew City Justin has loved touring the new breweries that pop up every month, has become an aficionado of Summerfest and loves cheering on the Brewers, Bucks and Packers. When not taking advantage of Milwaukee or forecasting “cooler by the lake”, Justin loves relaxing at home with his wife and Wisconsin Humane Society adopted dachshund Peeta, enjoying a good movie or book, and singing on his church's worship team. P.S. The Thompson-Gee in Justin's name comes from a combination of his parent's last names. When Justin's parents married they hyphenated their last names forming Thompson-Gee. The Thompson comes from his mother's side and the Gee from Justin's dad. ESPN: Giannis turned down starring role in "Space Jam 2"
Whitefish Bay School District sends letter to parents after reports of students asking for "N-pass"